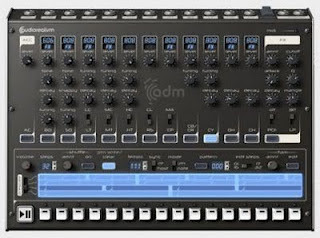 ADM contains 25 drum generators, each one carefully modeled after the classics' analog circuits and 4 PCM players, for a total of 34 sounds (some generators have two sounds). Certain sounds have been extended with extra parameters, like the tuning and attack of the 606 bassdrum. The accents effect on bridged-T oscillators that make up the bassdrum and tom-tom sounds has been closely simulated and the hihats and cymbals sound and react very close to the originals. The PCF can be used to automate any of the drum machines parameters, for instance it's possible to change the cutoff and Q parameters for each step. In fact it can control any of the drum machines parameters, for example you can set the amount of snappy on each step or switch from maracas to handclap on specific steps, giving the illusion of more polyphony (something that had to be done by hand on the original machine). The PCF can also control the amount of mangle (a type of distortion) on specific steps, and if the FX should be applied to a sound or not.